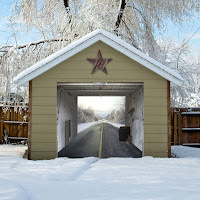 This "Winter Road" garage door cover by style-your-garage.com makes it look like a long road stretches through a snow-covered landscape behind your garage. The brainchild of Thomas Sassenbach, "Style-Your-Garage.com" has updated its collection of designs for the holiday season. This is the first time that the German firm has produced a Christmas collection to add to its popular tromp l'oeil garage coverings. 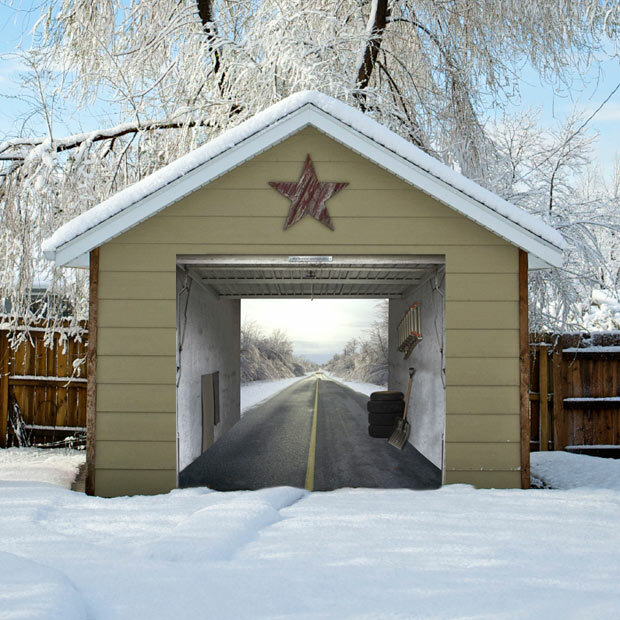 Their garage billboards can give any standard garage door a whole new look. The printed 3D designs are deceptively realistic and will make everyone stop and stare.Watch the company's promotional video here. They have over 250 different standard designs and a number of sponsored designs for you to choose from. What’s more, they can also create a customised photo tarpaulin for your garage door using one of your own digital images. Photo films for interior doors too! Interior doors are mostly dull and often unimaginative. But that’s all changed now! With full-surface, high-quality photo films, style-your-door.com can give boring interior doors a whole new look - and suddenly there’s something “behind a door” that you normally wouldn’t find or expect.